What I should be doing right this minute - and what will be the very next thing I do - is writing a story about travelling on the Ghan, the train that connects the top and bottom of Australia, running between Adelaide and Darwin. It's an epic trip: 3,200km, three days, two nights, two stops, two engines, 30-odd carriages, and 125 years in construction battling heat, flies, floods, termites and unreliable funding. The Ghan and I have history - in 1975, on my first solo trip overseas, I travelled on the old one up to Alice Springs, which was the end of the line in those days. I went to see Uluru/Ayers Rock and have a general look around, then a couple of days later turned up at the station to take the train back down south so I could start my holiday job on a sheep and cattle station in the Clare Valley, working as a polo pony groom. Except the gate was locked, the station was empty and there was no Ghan. Turned out the man in the ticket office in Sydney who'd booked it all for me hadn't allowed for the fact that there's no daylight saving in the Northern Territory, and so I'd got there an hour late. And it wasn't due back again for three days. And I was being met by my boss in Port Pirie. And I was out of money. And then, when I was climbing back over the gate with my backpack on, I lost my balance, fell and took the top off my big toe. So a passing police car took me to the hospital where they fixed me up, I used the last of my cash to send a telegram and buy a loaf of bread and a jar of peanut butter, and some nice French Canadians at the Youth Hostel took me under their wing and let me trail round with them for the next few days. And it all ended happily ever after: they even gave me their tent that they didn't need any more, and I've still got it. 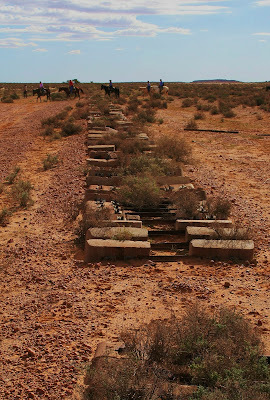 Then in 2007 I was back in SA riding along on the Great Australian Outback Cattle Drive for 5 days, having a wonderful time helping to move 500 head of cattle along the Oodnadatta Trail, which follows (or vice versa) the old Ghan narrow-gauge track before it was moved to a less flood-prone route in the '80s. I brought home a dog spike, eaten by rust but still strong. And then there was this trip, when I was the most comfortable person on the train, travelling Platinum Class in a double cabin all to myself: best sleep ever, in a big bed with fine sheets and the rocking of the train. Except when it stopped, mysteriously, in the middle of nowhere, with a sudden jerk. Turns out an American backpacker had got back to the station in Port Augusta after stretching his legs just as the train was pulling out, ran desperately after it along the tracks, climbed into a stairwell and spent the next two and a half hours clinging there as the train thundered along at 110kmh through the dark - and cold - desert night, before he got someone to hear him. Idiot! They had to peel him off, suffering from hypothermia. He vanished at Alice Springs, but a week later the peerless Sunday Territorian got the story and splashed it on their front page with a photo of the boy draped with smiling girls under the headline Ghan... but got forgotten. You fell over climbing a gate way back in 1975! Was that the start of the falling over hobby? It was certainly the start of the Red Centre getting under my skin.